The Office of Student Administration and Equity Services (SAES) manages all aspects of Higher Education admissions, enrolments, examinations, progression and fees. Across the Higher Education and VET sectors, the office administers scholarships, student records, the University cashier and timetabling. Student Central and the University Switchboards at both the Casuarina and Alice Springs campuses are the first point of contact for prospective and current students to the University and are operated by SAES. The office provides system set up support for the student system, the development and operation for the student management system (Callista) and coordinates the University's graduation ceremonies. SAES provides counselling and careers and employment services for students. In addition, the Office provides off-campus accommodation and disabilities services to both staff and students of the University and hosts the National Disability Liaison Officer in the Northern Territory. 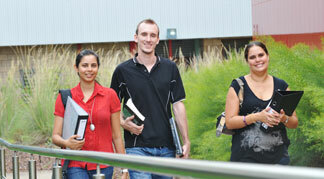 Student Central provides a ‘one stop’ service. Our highly trained and professional team are here to support you throughout your student experience. Equity Services provides support in a range of areas to assist you during your studies. As a CDU student you are welcome to access these services free of charge.